Sushi King - East Windsor, West Windsor, Hightstown NJ - Sushi Bar and Japanese Cuisine from webpowervideo on Vimeo. Sushi King is located in East Windsor. 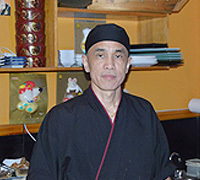 We offer authentic Japanese Cuisine, and the best Sushi in town prepared by our award winning chef Eric and his team. Our restaurant is the perfect place for you to chill out with your friends and family, and have an enjoyable lunch or dinner. We offer a wide variety of dishes to choose from, and we can customize it to your needs. The word "sushi" refers to rice that has been seasoned with vinegar, sugar, and salt. Sushi is traditionally eaten with fingers in 1-2 bites, although many people use chopsticks. It is not considered polite to pass food from one person to another using chopsticks, as this parallels a Japanese funeral ceremony. It is more appropriate to use the blunt end of your chopsticks and pass the food you want to share from one plate to the next. The Japanese usually eat miso soup not at the beginning of the meal, but at the endâ€”to aid digestion. Knives used by sushi chefs are the direct descendants of samurai swords, and the blades should traditionally be sharpened every day. Sake is a Japanese rice wine made of fermented rice, malt and water. Sake has an alcoholic content of 16% to 19% and its taste varies from sweet to dry. You can drink it warm or cold. When drinking Sake with Sushi, you usually warm it up to body temperature. Sushi: Many people believe that sushi means raw fish. Actually, sushi means vinegared rice. This term is based from the original use of fermented rice to store fish. Nori: Roasted seaweed. This is what is used to bind the rice and fish together. Temaki: Known as hand rolls. Nori is rolled into a cone with rice and other ingredients on the inside. Nigiri: Small slices of fish on top of rice. Normally served two per order. Sashimi: Delicately sliced pieces of raw fish. Sushi HosoMaki Maki HosoMaki: This is a sushi roll with a little rice and the seaweed is on the outisde. Futomaki: Large sushi rolls with plenty of ingredients within it. This makes it difficult to take a piece with one bite. The seaweed is either rolled on the outside or inside.